No matter what game you prefer to play, you need to keep in mind that all of them are different and the terms used in the games are different too. Bingo, like any other of games has its own set of terms, and you need to know them to make a perfect understanding of the game. 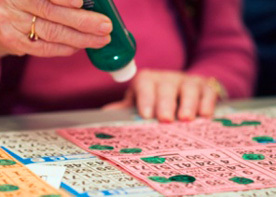 Auto-buy — option that purchases the Bingo tickets for the gamers before the game begins. ON or Being Ready — if the gambler needs only one number to get the winning pattern. Blackout — a pattern at which all the numbers must be marked to hit the win. Bubbler — minimum number of balls needed to complete the chosen game pattern. Caller — person who names the balls as they come out. Chat room — window displayed by your main game window that is for a chat. Dauber — ink dauber covering all the numbers on the bingo sheets once they are named. Free space — a free space in the center of the card which acts as a wild card and should be covered immediately. G.T.I., T.E.D — a feature that automatically marks all the called numbers and allows to play multiple packs. Hardway Bingo game — the card without free space. Jump the Gun — claim for the Bingo before the last of the winning numbers has been shown on the monitor yet prior it was named. Pattern — a unique shape of numbers that should be created on the game ticket and used to define a winer. RNG — means the random (occasional) number generator. Forwards/Backwards — all the balls in the cards which begin or end with the wild number. If the firstnumber is 22, it means that all the numbers that begin or end with 3 are the fell out ones. Numbers ending with 7, 8, 9 or 0 are to be retaken because there are just 5 balls which begin with 7 and no numbers that begin with 8, 9 or 0. Falsie (“social error”, “bongo”) — player who claims Bingo mistakenly. Before you move to choosing online casinos, get to know more about gambling laws and regulations dealing with Internet and land gambling activities such as sports betting, card games, slot machines, roulette game. You can easily refer to Indian gaming commission to find out more about your rights and duties.